So as you will know if you are a regular reader I have invested a lot of time and miles into trips to see tier 5 of English football. And I have to say I have thoroughly enjoyed it. Some of the clubs, and fans, have been very welcoming such as Lewes, Forest Green Rovers and Eastbourne Borough, and some of the football has been pretty good. However, with time ticking down on the season I still had three to visit. Not just any old three though – the three that were the the furthest from home – Barrow, Altrincham and Northwich Victoria. There was no way I was going to fit them all in but an opportunity arose for a twist on the two games in a day….Altrincham and Northwich were both at home on the same day, and seperated by just 12 miles of (almost) dual carriageway it was surely possible to do a half at each. Not one for all of the purists but it would serve a purpose and surely I stand a better chance of seeing at least half a good game than one at all. So on Tuesday 7th April, the Little Fuller’s and I headed off for a day at Alton Towers, followed by a night of 44 men and some leather (a title taken from one of Football Jo’s DVDs). Altrincham was going to be first on the agenda, with the first half of their game with Eastbourne Borough before heading down to the second half of Northwich’s six pointer with Woking. Altrincham are one of the great names in Non-League football. They were one of the founder members of the Conference in 1979 and won the league for the first two seasons. However, at the time there was still an end of season vote to get into the league, and not surprisingly the League Chairman closed ranks and outvoted the motion for their promotion. During the next few seasons they underlined their cup giant killing reputation, pulling off one the FA Cup results of the century when in 1986 they beat First Division (the top league at the time) Birmingham City at St Andrews. The past few seasons have seen the club collecting more four leaf clovers that a busy leprechaun in the run up to St Patricks Day. In season 2005/06 the club were deducted 18 points after it was found they had fielded an illegible player (during the games he played they won 18 points, hence the penalty) which saw them finish bottom. After all avenues of appeal had failed the club woke up one summer’s morning to find that Canvey Island could not longer compete and withdrew from the league, and Scarborough had breached the league rules on ownership and had all of their points taken away, meaning that Altricnham got a stay of execution. Twelve months later it was a similar story. Relegation was confirmed on the last day of the season, but Boston United saved the day after their financial situation on losing their Football League status saw them immediately demoted to the Conference North thus earning Altrincham their second successive reprieve. Did they learn? Not really as twelve months later it was the turn of Halifax Town to go into financial meltdown to save Altrincham from relegation. So what of this season? Well to start with you have had the disasterous situation at Lewes from day one which reduced the number of relegation places to three. Then the situation at Northwich (see below) reduced the places to two. Add in the impending demotion of Weymouth (they have lost their last ten games, conceding 37 and scoring just 2 goals in the process) and there was only going to be one place to avoid. And avoid they had done on the most part. Never dropping too many points to be sucked into the relegation mix the club had a decent home record that kept them out of trouble. Northwich’s season couldn’t have been any more dramatic. Forced out of their home for a period in early 2009 (they actually played home games at Altrincham) and still carrying a ban on signing any players they were all but relegated coming into this game. In fact anything less than a win against relegation rivals Woking would see them return to the Conference North (hopefully, but based on some of the strange financial criteria of the non-leagues, even that is not a given) where they had been playing a few years previously. Not that the problems have been that recent. 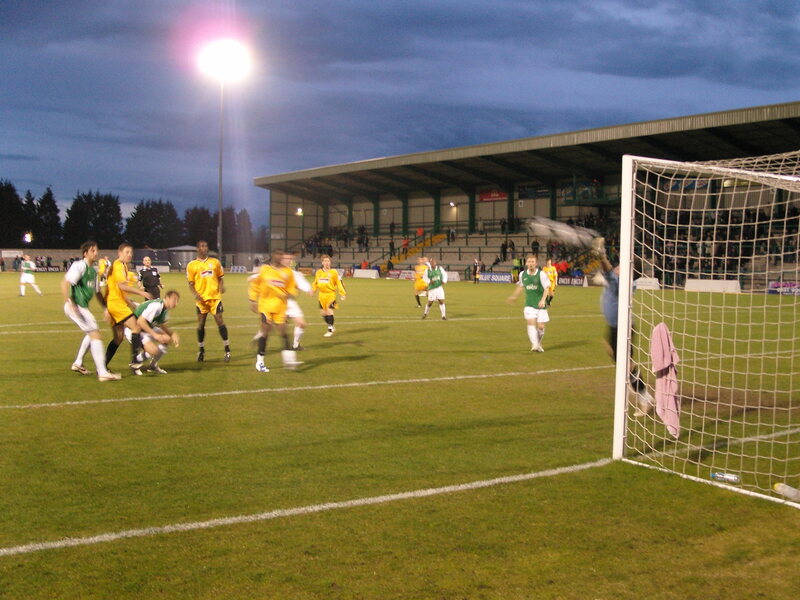 In 2003/04 the club finished in the relegation places, but in a similar story to Altrincham’s they were saved by the fact that Margate, Telford United and Hucknall Town could not compete in the league the following season. The following season they were forced into Administration, and whilst the ten point penalty was not fatal, the clubd had to chose at the end of the season between voluntary relegation or complete expulsion from the non-leagues after some harsh to say the least deadlines on the club ownership were not met – after all the registering of a name change of a club is a mjor issue and affected everyone right? 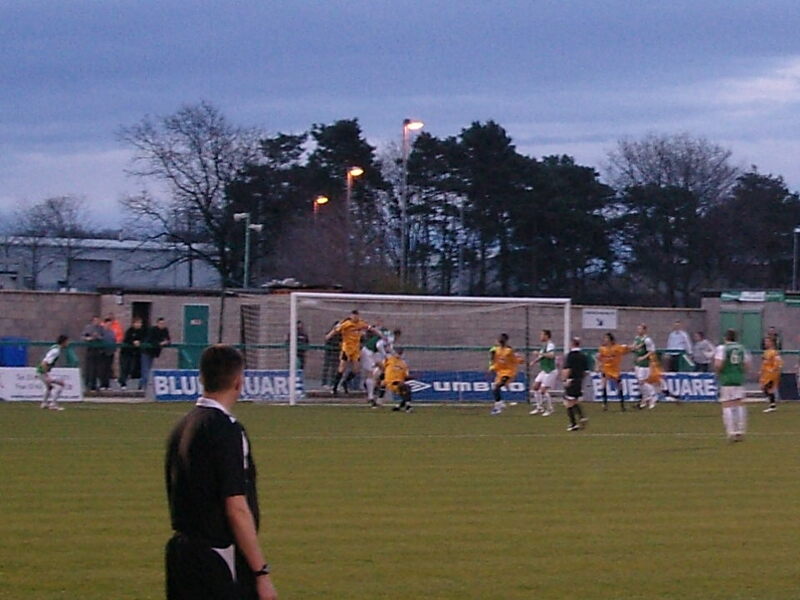 Their stay in the National League North was brief and they were soon back in the top level. That is when the fun (sorry Northwich fans it is only a pun) begun. 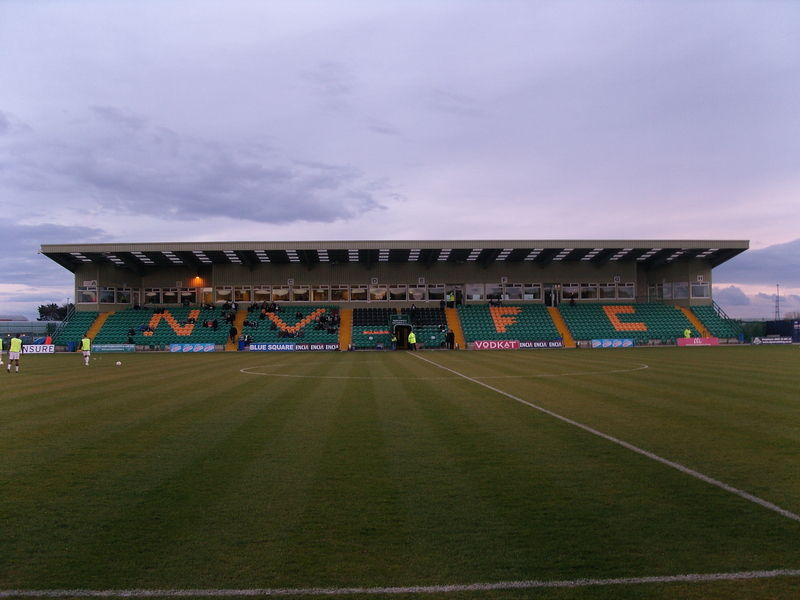 The club was bought by a consortium but the new stadium – the Marston Arena (having moved from the historic Drill Field in 2005) was owned by a property development company who went bust in 2008. So with relegation looming it would be interesting to see how the fans would react. I had tried to get a bit more information on the club but with the website offline it was a tad difficult so I apologise if any of the above in inaccurate. So the hour finally arrived after a day at Alton Towers with the Little Fullers and a slap up tea at Little Chef (yes they are still going), and we eventually found the Marston Arena. It is certainly remote, down a few country lanes and then down an industrial estate road. CMF will have been gutted she missed this as slap bang outside the ground was a Fireman’s training school, and there they all were polishing their helmets just waiting for a damsal in distress. 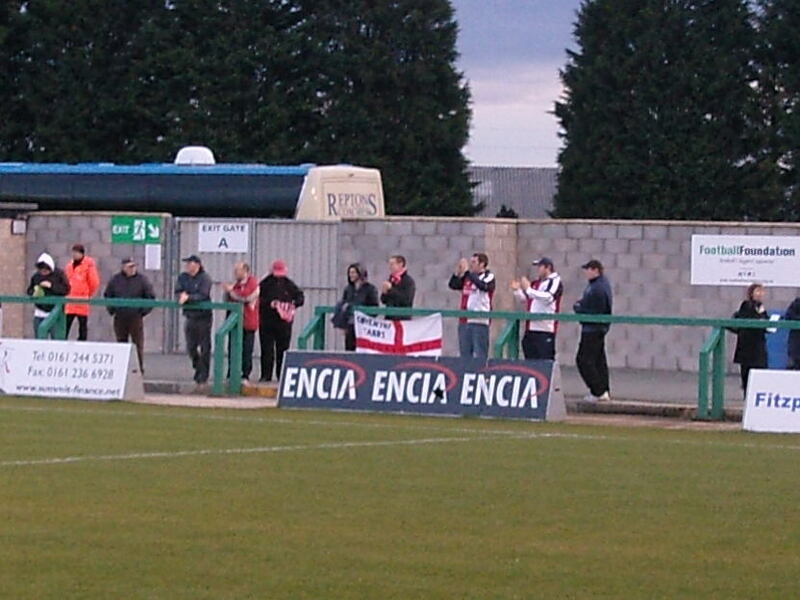 With the lure of Manchester United v Porto in the Champions League on ITV, the crowd at the Marston was very sparse. I got the Little Fuller’s on a maths exercise and they soon told me that there were 439 people in the stadium including stewards and players – not sure how they worked that out so quickly, but when the official attendance was announced of 450 I bowed in admiration at their achievement (although by then we had already left so should they have revised the figure by 3?). Woking came into the game managerless after the sacking of Phil Gilchrist last week and just one place above the home team but never looked at the races. The strong wind that whipped around the arena didn’t help matters and that hampered play to an extent. We wandered around the ground, trying to find some shelter, which was hard with such a small crowd. Littlest Fuller decided to try and put off the linesman on our side of the pitch by shouting “boo” at him and for the first ten minutes that was the highlight of the game. News filtered through that West Ham loanee Jack Jeffrey’s had opened the scoring at Moss Lane (filtered means I checked on my mobile internet!) and I already had pangs of regret that I had not chosen that game first. The first chance of the half fell to Northwich when a short back pass was almost ceased upon by Jonny Allan but the ball was scrambled away for a corner. On twenty four minutes the deadlock was broken as Joel Bryom’s deep free kick from the right was headed home by Simon Grand at the far post. Cue wild celebrations – wel as much as a couple of hundred could muster anyway. The rest of the half was really a battle against the elements although Woking nearly got an equaliser on the stroke of half time. As soon as the whistle went for the break, we were off….through the gate, into the car, no time to wait for seatbelts, and off down the lanes to the A556 that runs 12 miles from Northwich to Altrincham. Keeping within the speed limit and using our friend TomTom to good effect, exactly 14 minutes later we pulled up outside Moss Lane, where we immediately found a parking space opposite the main stand. Mission accomplished.